Detox products: NEW! Oral Fluid 6 Multi-Drug Saliva Screen Test Kit (AMP/MAMP/COC/OPI/THC/PCP). Pass drug tests, passing all drug test. Oral Fluid 6 Multi-Drug Saliva Screen Test Kit (AMP/MAMP/COC/OPI/THC/PCP) Oral Fluid 6 Multi-Drug Saliva Screen Test Kit is a 1-step on-site rapid drug test device for the qualitative recognition of Amphetamine, Opiates, Phencyclidine, THC (Marijuana), Methamphetamine, Cocaine, and their metabolites in oral fluid. Drug testing in oral fluid is more appropriate at this time in many facilities. 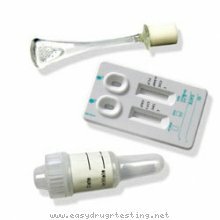 Oral Fluid 6 Multi-Drug Saliva Screen Test Kit, opposing to existing well-liked drug tests that require the person to donate urine, is an oral fluids (Saliva) drug test and is top of the line product, almost unassailable for any adulterants. Oral Fluid 6 Multi-Drug Saliva Screen Test Kit detects active drugs present in the saliva. This test is for forensic use only The designation of "for forensic use only" means that the substance abuse test is not FDA 510k Cleared. These types of tests are successfully used by law enforcement, correction and probation departments. Be sure to be legal and if you need to have FDA 510K cleared status, buy the following: Alcohol Breathalyzer AlcoMate CA2000 All urine drug testing kits (except QTEST-12 urine drugs screen cup) AlcoHawk Breathalyzer Note: FDA 510k Clearance by itself does not make legal substance abuse testing procedure. Anyway, in case you get a positive test result with any instant drug testing devices, you need to confirm it with accredited. Additionally, make sure that you fill-out properly the Chain of Custody Form.